Originally published on the StoreYourBoard.com blog. A friend sent me this picture earlier in the week with the caption, "Too bad we're at work...."
The first option sounds pretty appealing, but not so practical. Number two is against my code of ethics. So that leaves option three -- and with it comes two sub-options: complain or deal with it. And so I sit at my desk, looking out the window as the wind gently pushes the palm trees outside, imagining those palm trees were beachfront and that I was there, catching what could be the best waves of my life. But would they be the best waves of my life? Maybe. But they could also end up being big ugly close-outs that are next-to-impossible to drop in on. I'll never know, and that's where the anxiety lies -- missing out on unknown potential. Fear of missing out is an epidemic running rampant these days, usually tied to social media. But surfers have been feeling this for decades, as the responsibilities of life often don't line up with nature's gifts. Even when we're on the water, you hear arguments because other surfers snake waves. Or maybe you get mad because you slipped on that last drop in and you swear it was going to be the best wave you've ever ridden. Take delight, even on a crappy day -- fun is what it's all about, right? Expectation and imagined potential are the enemies here. I can sit at my desk and picture perfect barrels over my head, when in reality it's probably as dumpy as the aftermath of my last Taco Bell visit. I can look at a wave and imagine myself hitting every corner, spraying beautiful ocean mist over all the applauding onlookers...but we all know that's not happening. I'm not one to preach realistic expectations in life, but avoiding regret in the water (and life) involves a healthy balance between optimism and reality. The other key to fighting FOMO is being happy where you're at (aka - contentment). After all, if you're stuck dwelling on missed opportunities, you won't be living optimally in the moment. 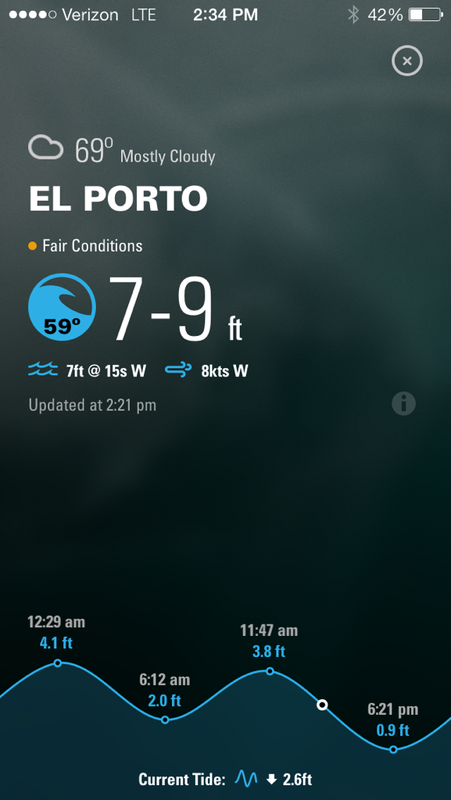 Yeah, I missed the peak part of the swell, but maybe I'll catch some nice waves on Saturday...and it might be huge, or it could be a bust. But as any surfer will tell you, "It's always nice to get out on the water," and that's enough. Everyone deals with this -- anybody have more tips for enjoying life when you can't make the swell? 2 Corinthians 6:2 - "For God says, 'At just the right time, I heard you. On the day of salvation, I helped you.' Indeed, the "right time" is now. Today is the day of salvation." Genesis 24:12 - "Then he prayed, 'Lord, God of my master Abraham, make me successful today, and show kindness to my master Abraham.'" So much of our lives are about tomorrow (the next job, retirement, buying a house), and I'd wager that a lot of our prayers are similar. But God is here, right now; active today. How does that affect you? The other day I was trying to put myself in the mindset that God is taking care of me right now. In that place, I literally don't have to worry about anything because God is real, and has promised to take care of me. Try and exist in that moment - where God is literally holding you in His hand. You are sustained, right now, because of God. That's beautiful and freeing. I have been pretty stressed this week with an overload of responsibilities and activities outside of work; so much so that I woke up this morning with a headache just trying to figure out how I'm going to do everything I need to do. On the way to work, I was thinking about how there was literally nothing at that moment I could do to help me finish any of those things, and so what was the point of worrying about them? This isn't a reckless abandonment of responsibility, but rather existing in the moment, because that's all I have. Here are some notes from the sermon, based on Romans 12:1. Romans 12:1 - "Therefore, I urge you, brothers and sisters, in view of God's mercy, to offer your bodies as a living sacrifice, holy and pleasing to God--this is your true and proper worship." What does God want in response to His gift of grace? God is only honored with a particular form of worship. "true and proper worship" or some translations have "reasonable"
"offer your bodies" - our most valuable possession, everything! God wants our dreams, our pasts, our futures, everything...trusting God's mercy for our past and His hope for our future. Is worship a normal part of life or the anomaly? Are worship events the rare thing? Note: This was written some time ago, so present tense items are not actually present tense, which is ironic in a way, given the subject matter. It's been a while since I've posted. 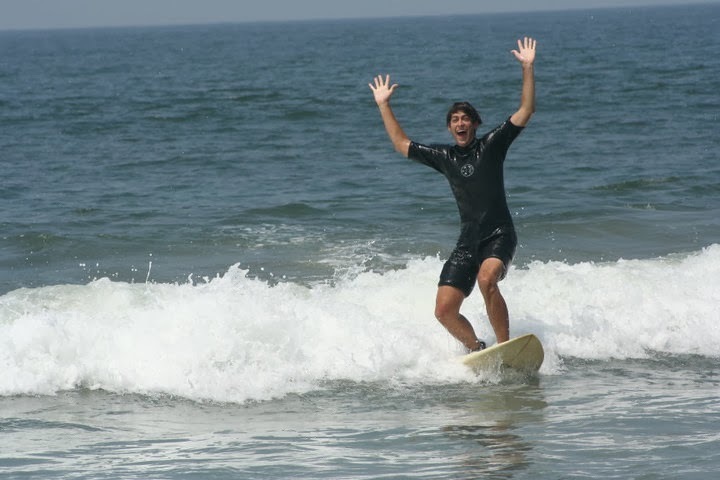 The holidays slowed me down a bit, and I've also been surf blogging for StoreYourBoard.com! Check out the blog here. Here is the first in a series from Joseph Barkley at Ecclesia Church...ALL IN! It's a study of Romans 12, and this first sermon is a quick summary of Romans 1-11. Joseph talks about how there are certain things in life you can't do halfway, like cartwheels or backflips. I would add dropping into a vert ramp (watch Jason do it in this video at 4:27). I remember dropping into that same vert on a skateboard -- it took me about an hour of staring over the edge in fear. It's especially scary because you can't do it halfway or ease into it. You either drop in and roll to the other side, or you fall -- all or nothing. All or nothing is a scary concept, but isn't that the way to live? As the Avett Brothers sing, "One foot in and one foot back, but it don't pay to live like that. So I cut the ties and I jumped the tracks, for never to return." That really resonates with me, as I want to make sure my time here is well-spent. Given the choice, wouldn't you pick a risky and fulfilling life over a comfortable one? It's dangerous, but as skateboarding has taught me, things are more fun with a little danger mixed in. Is the Christian life just a checklist of things to do and not do? Is this all that God wants from us? You have to trust that this is enough...it's not the cross + __________. Romans 6:18 - "You have been set free from sin and have become slaves to righteousness." We have been freed from our old destiny - Romans 6:23 - "For the wages of sin is death, but the gift of God is eternal life in Christ Jesus our Lord. As you trust God more, you can have complete peace because this is not going anywhere. God wants complete surrender - your whole self, all in. John 12:24-25 "Listen carefully: Unless a grain of wheat is buried in the ground, dead to the world, it is never any more than a grain of wheat. But if it is buried, it sprouts and reproduces itself many times over. In the same way, anyone who holds on to life just as it is destroys that life. But if you let it go, reckless in your love, you’ll have it forever, real and eternal." We have a tendency to trade "all-in" for rituals and behavior. We have given ourselves to something (a dream, relationship, identity), so why not give everything to Someone who knows us and how precious we are? Be honest with God, who is asking for everything...talk to Him about that.